Pieris, euonymus, heathers, ilex, elaeagnus and sedums. I've tried to provide winter interest with a variety of leaf colours. I found your wellies ! Lol. That's absolutely lovely winter planting TT. Cannot believe this pic was taken in the same country...well, I suppose it's not strictly speaking the same country, but you know what I mean!.....as my snow and ice plot today! I like the colour of your fence and trellis too! San, I think TT lives somewhere at the other planet with all year round Summer! :))) TT, just love your garden! Wow that looks fantastic TT. I didn't stay out in the cold for long .. just some quick snapping with the camera and I was back indoors ! Lovely scene to view from your window! Thanks, Arlene ... I must clean the windows some time ..Lol. Beautiful, TT....such a pretty assortment of planting and so nice to see in the cold of winter. 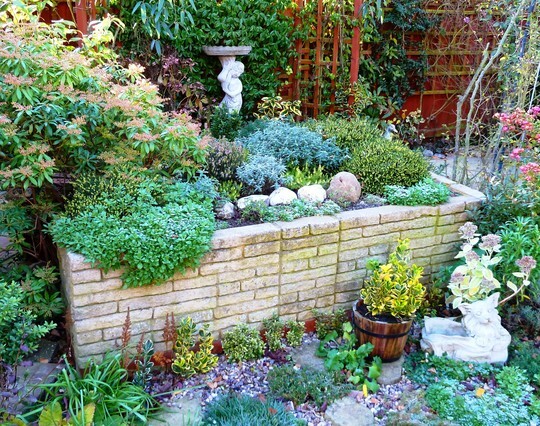 I especially like the raised garden idea....it must be so much easier to manage. That's one of the topics I edit ..
TT you could almost imagine it's still summertime from looking at that view, such a lot of colour! Are you still in summer, there, Tt??????????????????????? TT it looks absolutley lovely. A really colourful corner, TT.! I too love the winter foliage, especially the yellow ones. But mine are spread round the garden rather than together. We had 3 ins of snow yesterday, and its still pretty cold. Only the greenhouse to play in today! ... the greenhouse will be your refuge for a while...Lol. Lovely selection TT, makes a very attractive picture. Absolutely gorgeous TT, I do love your garden..mine is a frozen waste at the moment so its nice to see someone still has so much colour...have you a micro climate there?? Hi David ... I guess you still have lots of snow ! Sorry to hear you have so much snow ! our central heating not fixable as too old~going to be a very cold Christmas~ no heating no hot water! Grim! Oh help Arlene! Doesnt it ALWAYS go wrong when you least want it too! My friend got couple of those halogen heaters, they swing from side to side if you want, like a fan. They really bumped out the heat and light enough to carry from room to room. Didnt cost too much either..and elec cheaper than gas at present! will have to look into that~ currently got heat in the lounge from a large wall mounted gas fire and oil filled radiator and can put cooker or burners on with a pan of water in the kitchen but bathroom and bedrooms like the inside of a fridge! Oh Arlene...you are going to be too cold if this weather doesn't relent! I hope you are able to sort out an alternate form of heating until you can replace your central heating. We had that done last year (just the boiler; kept the original radiators) and we were sure glad we did. We spent a few very cold days last year before it was installed and the old system failed. Not fun! ~ Hi Whistonlass,I hope we can do something to last us until it gets a bit warmer, then get a new system too,have been looking online all day! ~it is very cold~have taken to wearing my woolly hat and scarf indoors! Arlene... how about portable electric radiators ? of the lounge/dining room as I don't like the gas fire on full strength because of the dogs. a new system in 20 years ago ~ but why would you when it was working well and has been all these years? The new systems are only garaunteed for 10 years! Progress?~ best use of resources? The boiler we had taken out last year was at least 25 yrs. old (and probably nearer to 30) but it was getting increasingly expensive to maintain. And of course it did eventually just give up the ghost so we had no choice but to replace it. The advantage of course is that we now don't need a storage tank or hot water tank as we opted for a combi boiler. I hope you can get something to get you through this coldest time....this will be when plumbers will be inundated with requests for central heating repairs/replacements...they seem to go awry just as the weather turns nasty. Good luck! ~ they are very warm TT~ good to have a cuddle with! Whistonlass~ ours was put in in 1972 when the house was built so it has done well! You really have an eye for landscape design. I love it! That is spectacular! Very well done, how long did it take you? I built this raised bed a few years ago from recycled large brick sections... they are very heavy, so I kept the design simple because they were extremely difficult for me to lift up. I set the bricks a little at a time, over several weeks during the summertime ... it was fun, though strenuous .. Yes, Pieris japonica Forest Flame ..
hi TT iam thilak you are having a lovely and colourful gardenvery nic. Thank you ... I'm pleased you like this photo ..
how did I miss this??? gorgoeus! this raised bed has good interest all year round ... which is lucky because I see it every day through the window when sitting at my desk ! i've probably asked before, but did you a blog on building the bed? Glad you like this, Linda ..
Hi again Fran ... I built this raised bed myself ... very difficult for me lifting the brick sections ... but I finished it before I joined GoY ... so, sorry, no blog on actually constructing ... I didn't take photos ..
... it is VERY sturdy .. Sometimes I climb on it ... Lol. lol you build to last, good for you!